Hardware Available in Chrome and Stainless Steel finish. Galaxy Shower Door Installation Manual. Special Glass Treatment - Nano Technology (Clear Shield). Sizes: 56- 60 x 66. Hardware Available in POLISHED STAINLESS STEEL and BRUSHED STAINLESS STEEL finish. Galaxy Tub Shower Door Installation Manual. Galaxy Frameless Tub Shower Door. You MUST be verified and have a confirmed address. We make sure the customer is 100% pleased. Our team ensures that orders are perfectly packaged to minimize room for damage. IF YOUR ITEM ARRIVES BROKEN PLEASE FOLLOW INSTRUCTIONS BELOW. Simply write items arrived damaged. Visit our showroom to see all products and much more. 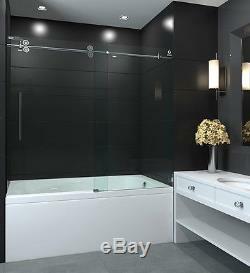 The item "GALAXY 56 60 x 66 FRAMELESS SLIDING TUB DOOR, 1/2 CLEAR TEMPERED GLASS" is in sale since Tuesday, November 3, 2015. This item is in the category "Home & Garden\Home Improvement\Plumbing & Fixtures\Shower Enclosures & Doors".